Horror is a lot like comedy. In order for laughs or scares to truly land, you have to rely on the build up of tension followed by a release. What’s interesting is that for a comedy you can have wall-to-wall jokes, whereas a film that’s wall-to-wall jump scares gets exhausting fast. 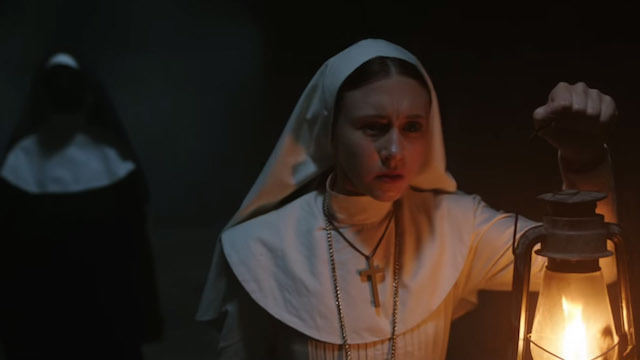 The Nun is a horror movie built on wall-to-wall jump scares, and it does get exhausting fairly quickly; however, it leads to a totally bananas climax, which, in its own overheated way, is entertaining. It’s 1952 (twenty years before the events of The Conjuring films, of which this is a prequel), and a nun in an isolated convent in Romania has killed herself. The Vatican, fearing that something weird is going on, dispatches Father Burke (Demian Bichir), a self-described “miracle hunter” and exorcist to investigate. They’ve also sent along Sister Irene (Taissa Farmiga), a young novitiate, to assist. Irene is along for the ride because she had psychic/religious visions when she was younger. Once in Romania, the duo investigate the abbey with the help of Frenchy (Jonas Bloquet), a French-Canadian expat living in Romania. The abbey is shrouded in mist and shadows, avoided by the locals, and did I mention the demon nun (Bonnie Arons) who keeps trying to strangle the protagonists or eat their faces with her rows upon rows of nasty sharp teeth? Could it be that there’s some ancient unspeakable evil residing in the convent? Did I mention the demon nun, with the teeth? The Nun starts off as a gothic horror melodrama. In some ways the film recalls The Name of the Rose, with moody shadows, surreal images and heavy fog. There’s also a theme about how faith and reason are important in understanding God. Oh, who am I kidding? The Nun is barely concerned with exploring any “themes,” and is mostly concerned about jump scares. Every time someone goes off on their own, the titular nun will pop out of the dark and to say “BOO!” or try to strangle them. This happens with such frequency that the movie starts to feel a bit like a slog — but then we head into act three, and the film decides to go wonderfully insane. I won’t spoil it for you here. The direction by Corin Hardy is very stylish, and when he leans into the moody atmosphere the film really works. However, the film becomes less and less spooky when dealing with the nun with the sharp teeth. As the jump scares become more and more frequent, they become more and more ridiculous. On the other hand, I should admit here that many of the jump scares did get me, even when I saw them coming. If I had seen the film in a sold out theater, it would have been a blast. This is a film designed to be a date night scare flick, and on that score it’s successful. The script by Gary Dauberman, from a story by Dauberman and James Wan, treats the material with respect and never talks down to the audience. It doesn’t do anything you don’t expect (except for the third act). I do wish the film had established rules for the demon nun, because as it stands her powers are all over the place and do whatever the plot demands. The cast is good. Like the script, they all treat the materially seriously, which helps — especially when the insanity gets ratcheted up to eleven. Particular credit has to go to Farmiga and Bichir, who could have easily slept through their performances, but they’re pros and give the film the intensity it needs to work. The Nun isn’t brilliant, but if you’re looking for a date night horror movie, you can’t go wrong. I’d be lying if I told you that I wasn’t entertained, and it’s a sin to lie and I don’t want to be strangled by a scary demon nun. Two and a half out of three stars.